Issued Paris, 1828 by A. Engraved map with original outline hand color. Mounted onto a linen backing with blue cloth edging long ago, possibly as issued by the publisher. Very unusual thus, almost a wall map. Mythical range Mountains of the Moon is seen cutting across the middle of the interior. Numerous tribal names have question marks after them. Spotted, small old hole in left side blank margin, small old stain, still with a handsome age patina overall. 22" H x 28 1/4" W.
14 1/9" H x 19 5/8" W. Tooley's Dictionary of Mapmakers, v. [V43] A short presentation video of this item may be viewed by searching the listing title. We do not sell modern reprints. 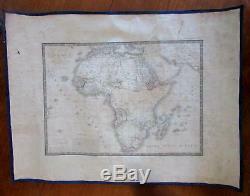 The item "Africa 1828 Brue linen backed map Mts. Of Moon" is in sale since Tuesday, February 13, 2018. 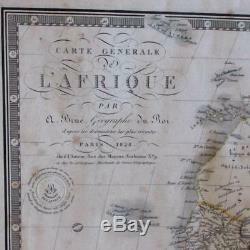 This item is in the category "Antiques\Maps, Atlases & Globes\Africa Maps". 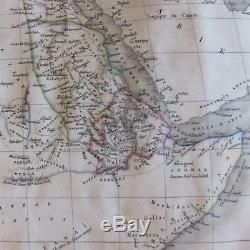 The seller is "oldmapsoldbooks" and is located in Dover, New Hampshire.